We've had solar power on this property for many years. Now that we're done logging it's time to build a cabin that will use that energy. We finally found the perfect place to build the house. It's right in the middle of the forest we so carefully thinned over the past 5 years, on a gentle slope with a nice view. But the photovoltaic system we installed in the early 2000's is a long way from there. So is the water line between the well and cistern. So, with the help of our friends and neighbors, we laid 400 feet of utilities this summer. We trenched through the trees to a road, then followed that to the house site. In the trench we assembled two electrical conduits and a water line. All of this connects to our existing systems at one end, and delivers power and water at the other end. We began in May by digging the 3-foot-deep trench with a backhoe. Our friend Curt is an expert at excavating on slopes, and that allowed us to take the shortest route with the trench. At $2 per foot for the PVC materials alone, shorter is better. On that subject, we shopped around for PVC and ended up buying it at Home Depot. The bulk prices for 2 inch conduit and water line were lower than anywhere else, and we could deliver it ourselves. Our contractor account got us another 5% discount. 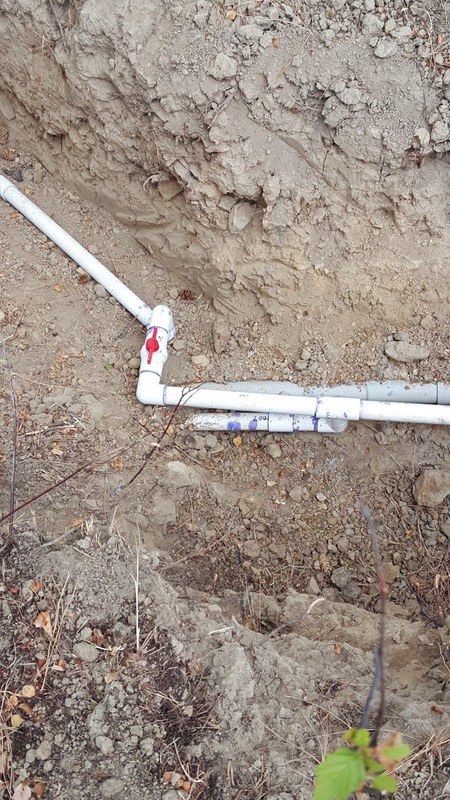 Net prices were about $0.50/ft for PVC conduit and $0.75/ft for white potable-water pipe and fittings. Our son in law Ben spent a day building conduit and cleaning rocks out of the trench. I spent a few Fridays with an electrician. Linda and I spent a day building water line and another day getting them all to lay together in the trench and pressure-testing the water line. 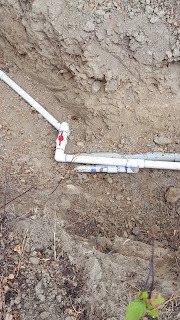 Where we connected to the existing water line we had to build a take-off, route past conduit, and install a shutoff valve for the new line. I came up with one take-off assembly that worked, but it had a drip. So I cut that out and installed a new take-off using a better design. Better because it kept the pipe lower in the trench, farther below the frost line. And it did not drip. We installed a frost-proof yard hydrant at the cabin site, backed by a 6x6 PT post. Beyond that we stubbed off the water line where it will continue to the foundation. Temporary power comes up at a different post a few feet away. The trench went through rocky soil for about 3/4 of the distance. The rocks were broken basalt rubble, up to about 10", with the potential to puncture our pipes. So we bedded the trench with 12" of clean fill dirt before pushing the excavated rocky material in over it. Between those layers we strung barrier tape, a metallic detectable warning tape that comes in a 1000' roll for about $28. Backfilling took a day, and repairing the road took another day, using a front loader and bulldozer simultaneously. By the end of August it was done. The extra dirt filled in a low spot in our road. The electrical cables will pass through the wall of our powerhouse and connect to the solar inverter. They'll be big wires, possibly #1 or 0, and expensive, so we'll run those next year when we need daily on-site power for construction. Anyone want to see video from this?